I've been waiting on the Lord to disclose to me what it is exactly He wanted me to share with you, how He wanted me to share it, which Scriptures, and so on. He gave me a really good kick-start one morning. I woke up to an electrical doorknob notice that said my electricity is going to be turned off in three days. We'd been waiting for a check, a donation that was normally on time and it was four days late. Well, I started to freak and He wanted me to share that with you because He wants you to understand how weak I am. In His own words, "If I can make her strong in My Word I can do it for anyone, that's for sure." I got hit really hard, my knees got weak, and my blood sugar went down. I'm thinking chocolate! Normal life stopped until that check came in. After I reasoning through it after awhile, and looked at the Lord's track record, I saw how foolish I had been. At the time you don't see that. You have to look at that in hindsight after you got over the shock quality of whatever it is you're dealing with. Really, guys I'm just very weak and a coward at heart. That's the bottom line. My youngest daughter once said to me, "Mom you are really strong." I told her in no uncertain terms that I am not strong but the God who lives in me is strong and keeps me on my feet. We started out on this journey of a teaching ministry that the Lord has called me to. He cleared up some doubts I had. I told Him I was not a good choice. His replied, "On the contrary, you're just perfect for the job. If I can have the victory in your life, I can have it in anyone's life. That's your mandate: Be honest, be transparent so even the weakest person can relate to you." So... are you weak? Guess what? I am weaker. If I can stand, you can stand, too. Let me share with you how the Lord has led me. I have to laugh because this experience really hit me like a bomb. I decided to go the Lord and straighten some things out. The Lord called my husband into a prayer vigil for me. I have to put everything into perspective. When he goes into a prayer vigil for me, it really helps. He's the power and covering that keeps us going. I knew immediately He was preparing me for this teaching on fear. So, I said to Him, "Lord I don't feel like I have any business teaching on this topic. Look at me! My knees are weak, my blood sugar is crashing and I'm not any example at all to be teaching this." He didn't hesitate for one moment and said, "Didn't I tell you this teaching was for you also?" He continued, "Do you know how many times a day fear interrupts us?" He means the ability to communicate together. "You were bound by fears: fear of displeasure, fear of dying, fear of disease , fear of losing your husband or your children, fear of Me... Even as kind as I am and as gentle with you, you're still afraid. Fear of uselessness, fear of failure... Don't you see how controlled you are by fear? This is universal to man." Well, that kind of opened my eyes when He said that. I just knew right away He wants me to be honest with you and share with you how I managed to get through these things. We live in a house in New Mexico. I have to say it's spiritually a very dark, dark place and there's a lot of New Age movement in this town. It's not easy to survive here. There has to be spiritual warfare on a constant basis. I told Him, "Lord, I didn't want to hear this. I thought I was beyond those fears. Now I see that was pride and ignorance on my part." He answered, "No, it's precisely that you struggle that I'm bringing you into confrontation with your fears. Do you know that everyone - and I do mean everyone - has fear? Yes, even that teacher that you like so well, that lady teacher who is strong as a truck driver. She even has fear, too. She has her buttons, just like you do." I said, "But she's such a good teacher." He said, "Everybody has a button. There's a button somewhere." So, I said, "Oh Lord, pass the ice cream.."
He said, "I am with you and I will hold your hand. but for now you need to be in touch with fear so you can administer peace to others." "Peace?! I don't understand it. How am I supposed to ministry peace while I'm fear-struck like this? My heart is weak, my throat is dry...please pass the ice cream!" He laughed and said, "No, pass the grace." He continued, "I have so many examples of My faithfulness in your life, but there still persists this nagging feeling of vulnerability that you're going to be undone. Even now, as we speak, you are still in the grips of it. It hits you like a blast of hot air." I wondered what He meant by that. Then I remembered waking up this morning feeling like a lily that was going to bloom... and now I feel totally wilted. That's the bottom line... We want to stay on course with the Lord. We don't want to go to the left or to the right. Satan so often uses fear tactics to cause us to either derail or go just a degree off and when we go just a degree off when we are on a long journey, we are way off of our destination. So I said, "Lord, how do I master this?" "You apply the Word," He said. "It's a poultice containing many medicinal ingredients." I don't know if you're aware of that word "poultice." Back in the old days, and even now, people who worked with herbs - they make a muslin sack with different herbs and they apply it to a sprain and it helps to ease the pain. He said, "You apply the Word. It's a poultice that contains many medicinal ingredients. The Word, the Word, the Word." Well, I thought I was applying the Word, but obviously not soon enough or not well enough. This is a lifelong challenge for us. I confess I struggle with fear a lot. I feel like a dartboard that the enemy throws a dart at and it sticks. I have to work it out using God's Word as the forceps and my history with Him as a clamp. I can look back upon my history and that holds me in place, and I can hold that wound while I use His Word to pull out that poisonous dart. It makes total sense to me that this would be the final teaching after intimacy, because without intimacy with the Lord you're really susceptible to fear. When we don't meet fear head on, it can become an underlying, motivating force that colors all of our actions and relationships and we don't even know sometimes how that's happening. We just respond certain ways, because there's a memory back in there that causes fear. It hasn't been confronted and it hasn't been dealt with. It becomes a button, really. We end up doing things automatically without even understanding "Why did I do that, why did I say that, or react that way?" This is universal to all men and women. It's fear of being ridiculed, fear of loss, fear of sickness, fear of rejection, fear of failure, fear of helplessness, and fear of poverty. These are huge things that really impact people's lives. I'll use me as an example. Let's say I feel very strongly called to serve the Lord. I really feel like there's an agreement in that area from peers and people around me. I think to myself, ' I'm called by the Lord, so I'm going to finish college, I'm going to get my house paid off and then be used for ministering opportunities.' Now mind you, that's the world's prudence talking. The Lord may want you to get on the next plane to Africa to work with established missionaries and to learn from them. That's more of His logic. I'm not saying He's always impulsive like that, but there's a great deal of prudence that comes from the world and colors our responses to the Lord's call. Let me share - the world's priorities often have nothing in common with God. When Peter left his net to follow the Lord he had a lucrative business, a family, children, and he worked at this for many years. And all of a sudden, he sees and hears the Lord and drops everything to follow the Lord. Nothing prudent about that. Nor was Elisha prudent when he followed Elijah. He took a yoke of oxen, slaughtered them, boiled their flesh, and then gave it to the people to eat. He then followed Elisa and became his servant 1 Kings 19. In my own life, my father-in-law bought us a brand new station wagon. We were thrilled. My husband was going to school and his father had bought us this beautiful station wagon. He probably got tired of hearing the calls about the car breaking down again. I never had a brand new car in my life and I was thrilled to have that security for my family. At the same time, the Lord began tapping on my shoulder and my husband's shoulder and calling us to the ministry in the mission field. It was a mission to go to Holland and there was a deadline for it. We tried to raise the $5,000 dollars that it would take to get us to Holland and pay for our courses, etc. The only way we could have done it was to sell the car. We could have gotten the $5,000 for the car easily. We thought and prayed about it and decided to be prudent not to sell the car and destroy family relations. His parents were not Christian and that didn't make it any easier. They were really nice masons and were very good to us. He wouldn't have understood our motives and they would have been looked down upon. We just wanted to do the prudent thing for the family. I had a dream not long after that. I was on a ship somewhere and on the ship I was called to the lower deck by the captain. So, I went to see the captain. He looked up at me with blue eyes and blonde hair. He was very handsome and had a sparkling presence. He said, "The Lord called but you missed Him. He'll call again." Then the dream ended and I woke up. Immediately I knew that was the Holy Spirit talking to me in my dream and He was telling me that I had missed the Lord by making this choice for security, money, and family rather than choose the Lord. This has been a life long struggle with me. I want to share with you how I finally overcame a major part of it in a little while. This has been a serious setback for me, having this affection for the world and the need for security. It seems like there's no end to the fears that the Father of Lies can conjure up against us. In my previous video, I had to say... if you think there aren't things that cause a fear response in you, then it might be a good idea to take a few moments to think about it. Think about the things that can cause you to go off the deep end because of fear. You don't have anything to lose by doing that and everything to gain. Knowing yourself is what allows you to put the devils to flight. We are our own worst enemies and that's the sad truth. Let's get back to the Lord's remedy for fear, which is the Word. I have to say the Word won't do you a great deal of good if you don't know the Lord. People who don't have a relationship with the Lord and quote the Word is just empty religious jargon. It's just history of the Jewish nation. But the Word to a Believer is a vital, living force that transforms and translates us from darkness into light on a daily basis. It's so powerful. If you don't have the relationship with Jesus, it's so easy to get. It's about the intention of your heart and a few simple words. "Lord I give you my heart and my life. I want to know you. Come into my heart, lead me and teach me. Amen." That's an invitation that He can simply not resist and your life will change overnight from dull, boring, confused, and dark to brilliant light, full of wonder, full of challenges that you thought you would never be able to overcome in your life. It's a beautiful thing when you give your life to the Lord. Because without understanding my relationship with Him, the words of the Scripture meant nothing to me before I was converted. I'd fall asleep while looking at them, thinking 'What do people get out of reading them? I don't get it.' When the Holy Spirit came and transformed my life, then I understood. It was like opening a book where it was 3-D pictures and history were going on right in front of me. All of a sudden my understanding was expanded. The Lord has done so many miracles in my life that there is no excuse for me to have any kind of fear. If you feel that way, too, don't feel bad. There is an explanation for that. I used to look down upon the Israelites who contended and complained to God about being in the desert. They were full of discontent and ungratefulness. I thought, 'How can they be like that after all the Lord has done for them?' I had my own take on the Israelites but now I recognize I'm not one wit better than they were. I'm just like them. In hindsight it seems incredulous, after crossing the Red Sea, they could have doubted that Moses would return down from Mount Sinai. I can't understand that. How can they think that after the miracles that took place after delivering them from Egypt? They doubted and they gave their jewelry to Aaron to make a golden calf. This is in Exodus 4. The Lord had given Moses three supernatural signs and the name of God to convince the people of his mission. He had a staff that would turn into a snake, that then turned back into a staff. He had a power to make leprosy appear on his hand. When he tucked his hand into his shirt and pulled it out again, the leprosy left. When he poured water on the ground it turned to blood. He was given these signs and wonders even before he was delivered from Egypt. Now, the Israelites witnessed a lot of plagues first hand to where they saw when the Egyptians suffered loss - they were protected. They had that in addition to it all. The flies, the livestock dying, the destructive hail, the darkness for three days, the death of the first born... They had seen all of it and walked away from it unharmed. People were handing them gold ornaments and silver just to get them out of their lives so they wouldn't have to deal with them anymore. Even after all of this and crossing the Red Sea and being kept on dry land. They even witnessed the Egyptians being caught in the middle of the Red Sea with the waves closing over them. They saw all of these wonderful signs from God of these miraculous provisions. Even after that they still complained and doubted. They thought the Lord brought them there to starve them to death. They thought, 'Moses must be dead so let's make a calf. The waters may be poisoned and we'll die of thirst. At least in Egypt we had meat and bread. The land is full of giants we haven't got a chance against them.' So, these were some of the things they were up against and they objected to. If we take a moment right now and think about all the wonderful things the Lord has done in our lives we'll be able to spot some real miracles of things He's done for us. Looking back on those miracles we would come away a little bit shame faced and say there's no reason for me to doubt the Lord's provision. He's done a lot for me and He's not going to stop now. What do we do when were threatened? We apply the scriptures but obviously it wasn't effective enough or persistent enough to please the Lord because He brought it up again to use the word...Use the word. He was chiding me to use it. We have a book called The Bible Promise Book. It's short and sweet and to the point. It's organized by categories such as: fear, laziness, Holy Spirit, lust, money, jealousy, lying, enemies and so on. It's a very handy tool when something hits you and you need to apply the Word. We also use the Psalms a great deal. Sometimes the Holy Spirit opens this book for us when we pray and gives us a scripture we needed to hear and we wouldn't have found if we went looking for it ourselves. We do trust Him with that. Recently, a woman died from the Hantavirus here in New Mexico where we live. The Hantavirus in the four corner regional area has happened before but right here in our town was a little bit threatening to me. I went to the Lord and went to The Bible Promise Book and the Psalms that He gave me from the scriptures was Psalms 91:3 "Surely He will save you from the fowler's snare and from the deadly pestilence. He will cover you with His feathers and under His wings you will find refuge . His faithfulness will be your shield from rampart. You will not fear the terror of the night nor the arrow that flies by day nor the pestilence that stalks in the darkness , nor the plague that destroys in mid day. A thousand may fall at your left side and ten thousand at your right hand but it will not come near you." Beautiful. Sometimes we'll abbreviate that and we'll take it and put it on index cards. We'll keep them by the refrigerator or where we do the dishes, or in the bathroom. Anytime we're struck with any kind of fear we pull that card and read that Psalms. I may abbreviate it to read, "Surely He will save you from the fowler's snare and from the deadly pestilence. Surely His faithfulness will be your shield and rampart. You will not fear the plague destroys at midway." I may shorten it just to make it easier to remember. Keep the basic feeling and promise there. Now there are times when an undefined, menacing feeling seems to be in the air and we don't quite know why it's there but something is ruffling our peace. It could be a thought, or suggestion, or something that we are aware of peripherally but not really understanding what it is. It could be a projection from a demon and we're not the content of it. For those times, I use my personal Word of Life box. I'm sure you've seen the daily bread boxes that people put on their table and there are Scripture strips in it. Many times I know they minister to people and they've really ministered to me. What we do is a little bit different. We take all the encouraging words that are important to us and write them down on an index card. We have them in a little box and go to them from time to time for encouragement. This will be something that we've dealt with before and the Lord has given us a word of encouragement for it and it reminds us of His faithfulness. That's a little tool we use. I encourage all of you to begin one of these and you'll be amazed at the results. They are personalized and it's like tucking the Word away in your heart and you save it. The Holy Spirit will bring it back to your remembrance for encouragement. Go to that box and pull a card and you'll be totally amazed how much He is on the same page with you. In my last teaching I talked about Lying spirits and how they slander the Lord's character. The same applies here. When they try to inspire fear in us, they use lies that denigrate His faithful character. The Lord is faithful. What the enemy would like you to believe is that He's not faithful. So, he lies to you. I do rebuke Lying spirits. You can bind Lying spirits as well as applying the Word. That's another tool the Lord has given us and it's important. We need to use it. Another medicine against fear is singing praises to the Lord. That accomplishes two things: it helps us to worship the Lord and be in His presence and also helps us to recall His faithfulness... and it infuriates the demons. I love to infuriate the demons! I think they deserve to be infuriated as much as we can do it. Just by singing praises to the Lord with thanks, it infuriates them. A lot of times that will break it. The demons can't stand to be around all of that so they'll leave. Whatever you're battling against will just vaporize. When my husband was in the hospital suffering from a failed attempt for a procedure that was very uncomfortable and very painful, I went off to a quiet space and I began to sing the Lord's praises. When I came back the doctor had finished the procedure and it had gone so well. He hadn't experienced any pain. That was a beautiful thing. That was the Lord's faithfulness and mercy. Not only was I uplifted by the singing but the demon's projecting the fear ran because they couldn't stand to hear it. The Word of God is a blazing sword of lightening that cauterizes the wounds of lying darts that try to provoke us. It's very powerful. 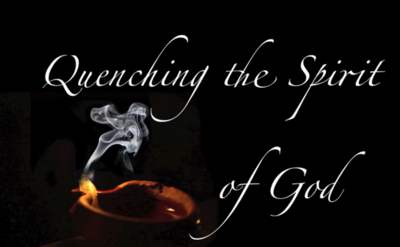 We cannot see in the spirit what really goes on but it's powerful. During most trials the idea of praise does not appeal to me at all. Maybe you're different, but I have a hard time praising in difficult situations. I know it's the right thing to do and with the Lord's help I enter into praise and that always changes the situation or the environment around. It's difficult to pull away and praise sometimes when it's a situation where there are other people involved, but you can always go to Scriptures and affirm over and over again God's faithfulness until peace is restored. I've seen that happen so many times. When my daughter-in-law was in labor she had to be air lifted and I went with her. I got deathly sick in the plane but I kept praying and singing the Lord's praises and she finally delivered the baby safely. You can truly count on this. The more we invest in seeking God and truly getting to know the Lord, the more convinced we come of His absolute providential nature. The more we realize how faithful He is and how intimately involved He is in our lives with the littlest things. In Matthew 10 the Lord said, "Are not two sparrows sold for a penny? Yet not one of them will fall to the ground outside your father's care and even the very hairs of your head are numbered so don't be afraid you are worth more than sparrows." That's a beautiful Scripture to recall when you're being hit by fear. It's comforting to visualize ourselves in the palm of the Almighty. The Father is holding us in the palms of His hands and protecting us. I want to share a little incident that happened in my life. I was in the parking lot of Wendy's eating a hamburger and I saw this little sparrow on the ground looking for something to eat. There weren't any crumbs out there. I was going to pick off parts of my bun and throw them out the window, and when I looked back - the sparrow was on a bumper of a car picking off butterflies, moths, all kinds of insects. He was having a feast. The Lord brought that car all the way from Texas with a grill filled with choice morsels for that little bird. How beautiful His providence is. How beautiful. For 30 years we've lived almost exclusively on the supernatural providence of the Lord. He gave me a lesson to share with you two days ago and today He pulls back another layer of fears to conquer. That's so much like Him. He protects us when were taking little steps and He encourages us because He knows that bigger challenges are going to come. Rather make us feel badly, like "Okay, you passed this little test... but there's a bigger one coming!" He cheers us on, just as we cheer our children on when they take their first little steps. One day we know they will have to walk two miles to school in the wintertime and cross a slippery parking lot to get to class. We understand that by then they'll have the skills necessary to make that trip. The Lord is the same way. We'll never arrive at complete security. There's always going to be a situation where we're not quit up to, and actually that's a good thing, so we don't become too self-confident and arrogant. It keeps us humble for sure. I recall the Lord's faithfulness and how many times we've had those electric shut off notices and how many times He's come through. We're in November and I'm watching our woodpile dwindle down and I know some how He'll bring a donation of wood to our door. Every year He sees to it. Although my husband has some health issues, we could go out and collect wood with our chain saw. We could do it, but then we wouldn't be obeying the Lord. This is our portion and what He's asked us to do. We can't do both things. We don't have the strength and the energy for both. That would be being disobedient of us, so we wait on God's providence. We got criticized for depending on the Lord and not working a secular job, but the Lord has assured us over and over again that He does not want us in the market place or in the world. He wants us in prayer, in worship, studying the Scriptures, and serving the poor. It was not His plan for us to get a job. We've been weak at times and my husband has gone out and applied for jobs. We both come from a healthy career motivation before we were converted. He never gets a job. It's just not God's will so He blocks it. Instead He brings us what we need. One day the Lord said to my husband, "Well, you have a choice here: you can go out and make your own living or you can continue to do what I've asked you to do and I will cover your expenses. Which do you choose?" Well that's no contest unless you're afraid of what people think. "They'll think that I'm lazy." There's that fear again. If we were to bow to the fear and run out and get jobs, that wouldn't be in the Lord's will. Falling into fear can change the whole course of your life. If you're dedicated to serving the Lord, the last thing the enemy wants you to do is serve the Lord. He wants to put you back out into the secular world and make you too exhausted to serve the Lord. There are people who are called to make tents and to teach. That's up to God. He makes the choices with His servants what He wants them to do. Back to what the Lord told my husband, "You can either believe me to cover your expenses or you go out and make your own living." The Lord brought to my mind that I want to share with you. John 6:28, "Then they asked Him what must we do to work the works God requires and Jesus answered, 'The work of God is this to believe in the one He has send."' That's work. That's hard work because you will get tempted and criticized for believing and not taking action yourself and not providing for yourself. You will be criticized for that, so it's work to cleave to the Lord and cleave to His Word and not allow those things to shift you into a different direction. How beautiful. The Lord has given us a complete understanding of how He wants us to operate. He's left nothing unstated that needs to be stated. "Take hold of the faith and contend for it and not be shifted by man or by the enemy or by our flesh. " I love to make pesto for my family. Sometimes we don't have the resources to buy sweet basil. Just a couple of days ago I asked the Lord to please send some sweet basil in. The very next day we get this cold produce from the markets and we collect it and distribute it to the poor. As I was going through it, removing the fruit and vegetables that were rotten, sorting things out and cleaning them, there was a little bag of sweet basil on the bottom. That night we had pesto! It was wonderful. He has done this for us over and over again. There is no excuse for me falling into fear and crumbling into a ball and becoming an ice cream addict when things don't go right. Why do I get intimated by this? Why? I'm weak, I'm short sighted, I have short-term memory loss and again, I'm very human. The Lord said, "If I can do it in your life, I can do it in the weakest person's life." and that's why I'm sharing this with you. He manages to keep us on our feet and moving in the right direction. He wants us to contend for the faith. If the Lord, for some reason, should allow the electricity to be turned off in the winter time, we'll put the food in the ice chest, get the candles out and we'll pray and worship the Lord without electricity. We've lived without electricity for five years on a mountain, so we know how to do that. It's no big deal. The point is, it's up to His discretion. If He wants us to have electricity He's gonna pay that bill and bring the finances in for it. If He wants us to have a period of time in seclusion for prayer He may not pay that bill, and we'll make things work without. That's okay. Now we're talking about personal preference and attachment. Secretly, I don't believe He's going to do that, because it's necessary for us to mandate the work we have to do right now. But I made up my mind if He does it, then there's a good reason for it. That's one of the secrets of keeping your heart in peace is knowing He is in control. We'll go into that a little deeper in a moment. Conviction of "whatever He allows is to our benefit" is so important. Eventually we'll be able to look back upon that time and see what He was doing. We may not be able to see it now but we must know by faith it's for our good and the good of the Kingdom. There's another work here and that's abandoning the purse of our own opinion and resolution and follow whatever the Lord allows. We're far less of a target for the enemy's arrows when we're that detached. However, walking around with lots of opinions and expectations makes us look like a broad side of a barn. The enemy will think we're a nice target for his arrows. The less you have, the less you are of a target in that area. Much of my walk over the last thirty years has been about letting go and learning to receive the transforming wisdom of God without complaint. That has been the majority of my walk, having a grateful heart and being able to worship Him in all situations. I haven't arrived yet. I'm still in transit. I see a big difference now between the way I am now and the way I was before. Continuing in Luke 12, "Consider how the wild flowers grow they do not labor or spin yet I tell you not even Solomon and all his splendor was clothed like one of these. If that's how God clothes the grass of the field which is here today and tomorrow is thrown into the fire how much more will He clothe you O you of little faith." Later on in verse 29, "Do not set your heart on what you will eat or drink...don't worry about it for the pagan world runs after these things and your Father knows what you need but seek His kingdom and these things will be given to you as well." Thank you, Lord, for that bag of sweet basil and the many years we have gone without health insurance. Every time there's been a need, it's been covered and there have been some serious needs. It's a wonder and a marvel to me that the early Christians were so focused on the Lord that they cared little for their lives or for their possessions. Those are the main buttons of fear: our lives and our possessions. I believe that the presence of God in their lives was so strong that those things lost their significance. They were able to sell their properties and possessions and lay the proceeds at the feet of the apostles. Acts 4:35. That's how much in love with the Lord they were and how sure of His providence for them. They paid a great price, beside which the whole world had lost its luster: our Lord Jesus. I really didn't know how liberating it was to put myself totally at the mercy of God until my second call from the Lord. It happened during the course of two weeks. We lived in a three story historic building in an art district with antiques and all the fineries. It was a beautiful house with fireplaces in almost every room overlooking the oldest estate in our city. I, of course, had a matching wardrobe from Laura Ashley. We went from this to a tar paper shack on the side of a mountain in the Poconos in a forest in two weeks. Two weeks! That's all it took. Let me tell you God exploded in our lives. The time we had with our children was so blessed. Before, we'd be rushing here and rushing there doing all these things that go with this middle class lifestyle. There was so little time left with our children. We had running water when it rained. In the winter, when the well froze, we had to haul water from town. I had just given birth to my fourth child. Our lives were turned upside down. Everything that was superfluous was gone. It was just the necessities. That's it. We didn't even have enough wood to stay warm until someone lent us a chainsaw. My husband would then go out and cut wood. My prayer time went from 'Hi God. Bye God' in the morning to 2-3 hours of substantial worship and prayer. I entered into a prayer life that I never dreamed would be possible. The Lord rewarded us mightily for this change. He was part of the major factor in doing that. It was a choice that we made and when we did it was wonderful. I'm not afraid of losing anything anymore. What we have He can take if He wants it. I would like to hang on to the equipment and tools that I need but if I don't need them anymore, why would I hang on to them? That's His call. He gave us beauty for ashes quite literally. It's the world's ashes and the beauty of God for that. In Philippians 4 Paul said, "Not that I speak from want for I learned to be content in whatever circumstances I'm in. I know how to get along with humble means and I also know how to live in prosperity. And in any and every circumstance I've learned the secret of being filled and going hungry." Having pesto...not having pesto. Having ice cream...not having ice cream. Paul continues, "Both having an abundance and suffering need, I can do all things through Him who strengthens us." There's Paul's secret. The Lord strengthens us. If you give up things in your material life and simplify that's makes more room for God. The dynamic is so beautiful you can't lose. If He asks for a sacrifice He gives us the grace to go through that sacrifice. I found in times of extreme trial, maybe you have, too, the Lord's grace is greatly magnified. It spreads over your heart and mind and allows you to walk through every situation. The loss of loved ones, sickness, and death still carry a terrible sting and it's difficult to deal with, but the Lord promises in 1 Corinthians 10, "No temptations has overtaken you but such as is common to man and God is faithful who will not allow you to be tempted beyond what you are able but with the temptation can provide a way of escape so that you will be able to endure it." He's so compassionate and faithful. In 2 Peter 2:9 he says, "The Lord knows how to rescue the Godly from trials." That was Peter talking. I always keep this Scripture in the back of my mind: "We know that in all things God works for the good of those who love Him who have been called according to His purpose" (Romans 8:28). We can trust that. That's His Word and that His track record in my life. "Those He predestined He also called, those He called, He also justified, those He justified, He also glorified" (Romans 8:30). When God entered our lives He began guiding us to the degree that we were willing to let go - it was a supernatural event. He took us under His wing. He made a commitment to us. That commitment was a process of transformation in that very moment that will continue on in our life, until we are in front of the image of the Lord Himself. That's a very reassuring thought, so that in anything that's going on, it's the work of God to transforming us in one way or another. Maybe even if we don't see it until later on, we'll rejoice over it. How can we justify fear? The Lord is never lax on the job. He doesn't miss anything. If we truly get this concept into our hearts, the enemy will be frustrated in finding something to stimulate fear in us. Fear of the future, the fear of the unknown. I want to share a story with you. A horse rancher had bought a champion stud for his horses. All the people in town said, "Oh, he's beautiful. That's really good." The next week the stallion ran off and all the people in town said, "Oh, that's too bad. That's not good." The week following that, the stud came back with a whole herd of mares. The people in town said, "Oh, that's great! That's good!" Then, the rancher's son was riding a horse; he fell off, and broke his leg. The people in town said, "Oh, that's bad." Well the following week war was declared and all the men in town were drafted so the people that were left said, "That was pretty lucky that your son broke his leg. Now he's not drafted." The Lord writes straight with crooked lines. Our life is a patchwork puzzle that's all over the place, but we can see what He's been doing in our lives. There's not exactly a rhyme or reason to it and people don't always understand; but the outcome is good in our lives. It's good fruit. We never know how the Lord will bring what's good out of situations but we do know one thing for sure: He'll bring good out of it because He loves us and we're called according to His purpose. When things start to go awry in our lives, I think it's time to say, "Okay, Lord, what are you doing here? I want to understand." Take a step back and tuck in with Him and find out what He's doing and then cooperate with Him. It will take the power out of the demon's guns because you're not going to fall into condemnation against the Lord or the lies about you. Say, "Lord, I cooperate with You. You are in charge. Help me to see what You're doing. I receive it." That takes a lot of power away from the enemy. In my very first Youtube video called "Overcoming Fear" I shared that most of the time the enemy is not allowed to touch us, but he is allowed to threaten us with a smoke screen filled with fear and fearful possibilities. He's allowed to do that, but they're not allowed to touch us. People spend their entire lives being influenced by these smoke screens. He allows them to threaten, to cause fear, just like the movie Monsters, Inc. I've heard it said that demons feed on fear just like fire feeds on fuel. I don't claim to know the answer to that for sure, but I know that they generate a lot of fear about things that will never happen or may happen... but not in your lifetime. For instance, people listen to the news, search the net, fearfully surviving from moment to moment preparing for the worst. Their lives are all tribulated in this fear thing. Still, calamity that was supposed to happen has not happened yet - but all this energy and sickness has been generated by fear for years and years. I know how it feels, because I used to get on the net and see: "Is it the end of the word yet?" I did that, too, and the Lord called me to task on that. He said, "I don't want you reading that. That's fear mongering. You need to keep your eyes on Me, because I'm faithful. You don't need to know about those things. I'll take care of you. When things go down, I'm going to be there and take care of you, because you've been serving Me, you're faithful." Don't get tricked into following all of these fearful stories...wars and rumors of wars. Keep your heart in peace and spread that peace. That's what I'm trying to do here. I've been guilty of it and it can be an addiction. "Is Israel going to get bombed today?" We're looking for those things because we're waiting for the Lord to come back, but we get skewed with that and we end up getting into this amusement park wheel-of-fear that keeps going round and round. We can end up becoming addicted to the latest news and that's why the Lord says not to interest yourselves in those things. Keep your eyes on Him and stay in peace. The thing about fear is, it knocks us off course and steals the witness of our peace. Our peace is one of the things that is a witness to whole world of the power of God in our lives. If we're running around scared, tense - then we'll look like just the world. That doesn't point to Jesus. That points to our flesh and to the rest of the world and what they're doing. He wants us to be a witness to the world by not getting involved in these things. Keep our hearts and mind stayed on Him. We should declare the Lord's wisdom and providence to people who are in that state of nervousness and anxiety all the time. Encourage them to calm down. You love God? He loves you more. You can't provide for yourself better than He can provide for you. There's also another thing that can get us into trouble. There's no end to fear that can be generated unless you deliberately observe a 'no negatives' rule, forbidding talking about things that threaten, destroy, and discourage. We make a point to keep those things out of our lives and refuse to engage with other people over them. In our mission, we have people who come here and they are fearful about the future. And I have to say, "Not today, let's not talk about that". I'm not saying ignore everything. There are some things you should take care of. But this mindless gossip and going over and over again about how bad the environment is, how bad the financial crisis is - it doesn't serve any purpose at all. It takes our hearts and minds totally away from the Lord Jesus Christ. We're the temple of the Holy Spirit and He doesn't want to see it or hear it. That's what He told me. He has said, "I live in your heart, I don't want to hear that and I don't want to see it. This is My temple - you need to protect it." We work hard trying to protect it. We have a track record. In the past, we've been very critical and one thing I've noticed is that when couples get together and they're talking negatively about something - they end up getting into a fight between themselves. It's almost like, what you put out, you get back. We are very careful in our hearts first of all not to think negatively or talk negatively about people. We're not perfect, but we try hard. If you have marital strife and you talk about other people with your spouse - that very possibly could be the open door causing the demons to get in and cause strife in your marriage. When we closed that door, it made a huge difference in the way we looked to each other and spoke to each other. You've probably experienced this: you'll have an amazing day or go away on a retreat... and your husband will come home from work and be so angry and frustrated at what went on. Or your little one will come home and say, "Georgie pushed me off the slide". Your child is hurt and crying and you want to go and throttle the other child. Well, the first fleshly response is to find that kid that hurt your child and make them pay. That's the world and that's the flesh. Here's an example of the devil's character. He sees you're making so much progress with the Lord and you've had a beautiful day. I had a wonderful time in prayer and it just happened to me today. I come out and there's anger going on, on the property and I had to deal with that - and then I got angry and I had to deal with that. Then after it was all said and done and we made our apologies, we got quiet and still in prayer for two hours and got our peace back. We don't want to live our lives without His peace. Romans 8:31 it says, "What then shall we say in response to these things: if God is before us who can be against us? He that did not spare His own Son but gave Him unto all, how will He not also along with Him graciously give us all things?" Also in verse 35, "And who shall also separate us from the love of Christ? Shall trouble or hardship or persecution or famine or nakedness or danger or the sword? As it is written for your sake we face death all day long. We're considered as sheep to be slaughtered but know in all these things we are more than conquerors through Him who loves us. For I am convinced that neither death nor life neither angels nor demons, neither the present nor the future, nor any powers neither height nor depth nor anything else in all creation will be able to separate us from the love of God that is in Christ Jesus our Lord." That is unless we consent to it. We consent from being separated from His love. That's our choice and that is the whole motive behind fear. That's the devil's agenda. When he causes fear of any kind it's to separate you from God. The Scriptures say that "Liars separate close friends". That's in Proverbs 16:28. He will constantly try to alienate you and separate you from God or to lie about the nature of God as we covered before. If we don't consent to it then he can't do it. Jesus said, "I have told you these things so that in me you may have peace. In this world you will have trouble but take heart I have overcome the world" (John 16:33). That's what the Lord promises and He has given us the tools to do it with His help. I'm convinced that, in our culture that is so technically advanced, we have a very idealistic view of what life should be like. Everything becomes convenient, available, and achievable to anyone. We have Hollywood pictures of happily married couples, kids with all the latest electronic gadgets, two cars, an RV, a motorcycle, and college funds. It's a picture-perfect life, right? It runs smoothly and it's full of everything we need, and there's all the opportunity for advancement in the world. Frustration is in the world, yes, but you can always overcome those because you have everything you need. This is so often portrayed in the movie industry. We have Hollywood pictures of life to some degree and because we bought into this picture-perfect lifestyle, we're afraid to suffer loss or have want. We are a target for the enemy to stimulate us with fear because we've got so much stuff. All the enemy has to do is threaten this or threaten that and fear wells up inside of us. Our affluent comfort zones become the norm and anything that threatens that stirs up fear. I have to say I'm guilty as charged. What would I do without Ben & Jerry's Cherry Garcia ice cream? (Well, I found an alternate brand that's pretty good, so I've found away to get around that...chuckle...) I'd probably lose weight for one. You look at the Internet, TV, communications, cell phones and they are such nice conveniences and anytime they get threatened fear comes out. So what if you do lose your cell phone? We are attached to these things and they have become a part of our daily lives. A man like Paul was centered on the teachings of Jesus and he was content with the most humble of surroundings because Christ was his entire possession. Nothing could dim or dull the life because the presence of God was so powerful and strong. It's quite simple - the more we have, the more easily we can be strummed into fear. The more we have, the more we are a target for fear. Even Paul looking forward in his life to him being beheaded, that didn't dim his view of Christ. If our treasure is Jesus, then that will be a blessing to us. It'll be the greatest gift anyone could give us. If we've given our entire life to serving Jesus, why do we worry about sickness and death? If you don't understand what I'm saying here you'll need to listen to my other teaching "Why Wasn't I Healed" to understand my view point. If He takes me out of public ministry, I'll be in my private garden praying and worshipping Him privately. If He takes the house were living in it's because He wants to move us on and the house is in the way. If I don't have money for ice cream, I just might lose weight. I'm saying that for all of my sisters who are just as weak as I am. We are sisters and we love chocolate. We can't go wrong with less when Jesus makes the choice for you. The Lord revealed this to us in Florida. We had quite the experience there. Once day He started dealing with me that the whole world is my mission field. We had three children with us at the time. He was speaking to my husband's heart at the same time He was speaking to my heart. We said, "Lord, if you want us to walk away from everything here, we will." We had an RV, a van, and a two story furnished house with simple things. The next day a couple showed up at our church and they didn't have anything. The mother was nursing a baby and they didn't have a place to live, no clothes, and no car. We saw that as an answer to our prayer, so we made preparations to walk away from everything. We took sleeping bags, backpacks, hammocks to sleep in between the trees, and we disappeared into the everglades. We just started walking. Well, through a series of events we finally met a pastor from Columbia, South America and he invited us to come and share prophetically and to also share the choices we made in our lives with the people. We didn't know at the time that the guerillas were killing missionaries in Columbia when we went over there. We heard about it was a dangerous place to be, but we knew the Lord was calling us there and He would protect us. That was a big step in faith. We ended up in Columbia, and I remember one night in particular. We lived in a farm house on the outskirts of town. It was made from cement. It had open windows with no glass, just a few bars, and no doors. It was open to the air. At night we could hear the bats flying down and swooping in to eat the bugs. It was pretty primitive. We did have water and electricity, but mostly primitive. I was homeschooling at the time. I brought our children's books with us. On that night, we heard the guerillas coming down from the mountains. When they marched, it stirred up the dogs in the neighborhood. The dogs' barking increased as they got progressively closer. We knew they were coming down where our little farm house was. We just had to pray and ask the Lord to be our confidence and trust that He would save us from being attacked by them. Sure enough, they kept on walking and went into town. They had relatives there. The Lord did protect us while we were in South America. My children still tell me all the wonderful things they learned and how grateful they were for that trip. I have to admit it was a little scary, but we knew it was His will. We got our chance to talk on the radio and at churches. It was a good, rich time of ministry. We encouraged the Columbian people not to run after the American dream. Don't run after that lifestyle. Keep your simple lifestyles where your family and your faith are your absolute priorities. They listened and I'm sure the guerillas we're listening, too, by radio. They already knew about us before we got very far, because they had spies everywhere. If I die, then I know my work here is done and I can be with the Lord. We have a website Heartdwellers.org and on this website is our book of experiences. The Lord has taken us to Heaven and still does many times. We shared those experiences in Chronicles of the Bride, which is a free book you can download. We have music to go with that, that is also free. I encourage you, if you have any fear of death or know someone who is dying and they have a fear of death, look into that book. If you write to me I'll send you a hard copy at no charge. Share the book with anyone who is afraid of death or what comes after death. What we shared in that book is only the tip of the iceberg of what has actually transpired since that time. Maybe we'll come out with other volumes. Getting back to fear, if he takes my husband He has a plan. If He wants more of my time, then He'll be my companion, like before I was married. Mind you, I'm reasoning a lot with myself. I'm not to the point where I'm totally without fear. I haven't arrived in that place at all. Don't get that false impression, but I have prepared my heart and my mind to be as detached as I can from the different possibilities that the devil might use to steal my peace. In summary, when threatened with fear, may God be your refugee until the storm passes. You remember the scripture when the apostles were in the boat with Jesus. He was asleep in the back of the boat. They were threatened with being swamped with this tremendous storm. They were threatened with being capsized and all dying and the Lord says, "Peace be still" (Matthew 8:24). All of a sudden these probably 20-foot waves calmed down just like that. He's Lord of the storm. Many times, when there's a storm that hits us of some kind, He reminds us He is Lord of the storm. He has proven it so many times over. He is our refuge. Tuck in and seek Him and ladies take your dark chocolate with you. The next step is to be humble. Take a step back from the situation and ask the Lord, "Lord what are You trying to do here?" Trust in the Lord with all of your heart. Don't lean on your own understanding (Proverbs 3:5). Trust that the Lord is for you. Jeremiah 29, "For I know the plans I have for you. Plans to prosper you and not harm you, plans to give you a hope and a future." Recall the good He has done in your life with an attitude of thanksgiving. He has a track record. Psalms 4:5, "Many Lord my God are the wonders that the things you planned for us. None can compare with You. For I can speak and tell of Your deeds. It would be too many to declare." Refuse to rely on your own wisdom and rely on your prudence. They are very shortsighted. Rely on the Lord and cooperate with Him and what He is doing. The next point is not to allow gossip or negative talk, which will magnify the situation. Be the temple of the Holy Spirit and be peaceful. Be free of offensive criticism and news and remove yourself from every occasion of fear. If you talk back and forth with your husband about critical things and gossip, you're probably going to get some backlash where you'll end up being at odds with each other. Avoid doing that. It is a sin anyway to judge people and for the health of your marriage. Waste no time combating the fears with an anecdote of Scripture. Go to the Scriptures to get a Word that you can stand on and repeat. Set your heart on that Word and it will protect you. 2 Corinthians the tenth chapter, "We live in the world, we do not wage war as the world does. The weapons we fight with are not weapons of the world; on the contrary they have divine power to demolish strongholds. We demolish arguments and every pretention that sets itself up against the knowledge of God and we take every thought captive and make it obedient to Christ and to the word He has given us." Take those thoughts captive. Don't let them take you captive. In Luke 10:19 He said, "I've given you authority to trample on snakes and scorpions and overcome all the power of the enemy. Nothing will harm you." Then have confidence that God is in control and the enemy is on a short chain. The Lord is totally in control of what the enemy can do and not do. Remember, we're more than conquerors, as it says in Romans 8:31, "God is for us, who can be against us? And in all these things we are more than conquerors." In John 16:33 He says, "I have told you these things so that in Me you may have peace in this world. You will have trouble but take heart I have overcome the world." Not only has He overcome the world but He has given us the tools to overcome the world as well. 1 Corinthians 10:13, "And God is faithful and will not allow you to be tempted beyond what you can bear. And when you are tempted He will also provide a way out for you. You must live with a holy perspective. Start letting go of things with material value, except to be used as a tool for the Kingdom and as God wills. The frills and the nice things can be distracting and can be necessities in your mind or my mind... like, "you have to have it." The more you deem things necessary, the more of a target you'll be and the devil can attack and steal your peace. The more complicated your life, is the less time you'll have for the Lord. I'm totally convinced that whatever He removes from our lives He will fill us with so much more of Him in return for that. Hide the pearl, the pearl of great price in your heart that all others things may be stripped away if necessary (Matthew 13:46). We are living in turbulent times right now. We don't know what will happen tomorrow or next year but we'll know one thing: the Lord is timeless and he is the pearl of great price. Don't let anything compromise that relationship. Don't let any fear come in and pry you away from Him. Finally, the last Scripture I want to share with you is 1Timothy 6:8, "For we have brought nothing into this world so we cannot take anything out of it either. If we have food and covering with these we shall be content. And those who want to get rich fall into temptation and the snare and many foolish and harmful desires which plunge men into ruin and destructions." So much of the world is out for money and things. Half the battle in overcoming fear is detachment and setting priorities according to God's will. The other half of the battle is to trust in the Lord, that He has complete charge of your life of what comes and what goes. So, those are the other main points. In America, we're undergoing one financial crisis after another and the Lord has spoken to me about why He is allowing this. That's going to be my next video. I think you'll be shocked at what He has to say. God bless you all and thank you for tuning in.